The Artmore Hotel is a unique midtown Atlanta hotel. 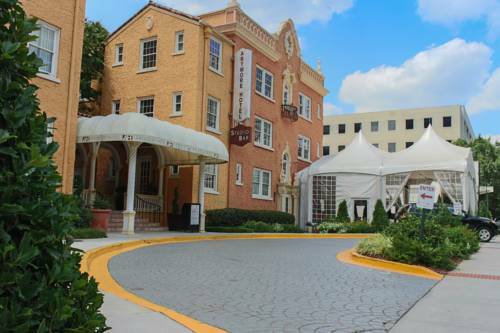 An independent boutique hotel the Artmore prides itself on delivering a personalized guest experience not previously seen in Midtown Atlanta. The scope of the renovation began with a restoration of the buildings facade a 1924 building whose design is based on Spanish Mediterranean aesthetics. Situated on West Peachtree Street in the middle of Atlanta Cultural Arts District is the newest boutique Midtown Atlanta Hotel. The Artmore is the reinvention of an historic architectural landmark building in the heart of Midtown Atlanta. Check out the Studio Bar and Cocktail Lounge for a cocktail before or after a night on the town. Centrally located in Midtown Atlanta. All reservations must be cancelled 72 hours prior to arrival to avoid a penalty of one night room and tax. Exceptions may apply - Please see rate rules. The Studio Bar and Cocktail Lounge is a hip and contemporary lounge space offering beer wine and signature cocktails in a comfortable modern setting. Relax and unwind with a variety of wines by the glass and by the bottle as our list continues to expand. The Atlanta Botanical Garden is a 30 acres botanical garden located adjacent to Piedmont Park in Midtown Atlanta Georgia USA. The home venue of the Atlanta Symphony Orchestra. It is located within the Woodruff Arts Center at 1280 Peachtree Street in Atlanta Georgia USA. With its renowned collection of classic and contemporary art and award-winning architecture by Richard Meier and Renzo Piano the High Museum of Art has grown from its origins in a stately home on Peachtree Street to become the leading art museum. A historic house museum located in Atlanta Georgia. The structure was the home of author Margaret Mitchell. Located in Midtown at 990 Peachtree Street the house was known as the Crescent Apartments when Mitchell and her husband lived in Apt. The World of Coca-Cola is a museum showcasing the history of The Coca-Cola Company that contains a host of entertainment areas and attractions and is located in Atlanta Georgia at Pemberton Place. Atlanta premier destination for shopping dining and events for the entire family located in the heart of Midtown Atlanta. A mid-sized concert complex comprising three separate venues and located at 1374 West Peachtree Street NW in the heart of Midtown Atlanta Georgia.